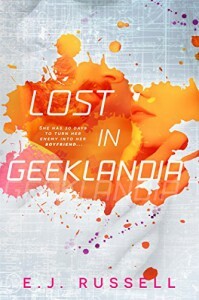 Lost in Geeklandia is a cute romance, heavily laden with geek references. The book starts out by introducing us to Charlie, a socially-awkward woman who is aiming to get her perfect job while still helping set her friends up in successful romances using a statistics program that calculates compatibility based on a person's online/social presence. The problem comes in when an old friend comes back to town. Daniel and Charlie used to be close, but events pushed them apart, creating hard feelings. Unfortunately, Charlie's dating program is based off a scam that ruined Daniel's career, though her system actually works! Daniel is on a quest for redemption, and throwing a wrench into the works is the fact that the program actually picks them as a likely match. The characters are fun and the author does a great job of bringing them to life. I also loved the geek references - including Star Trek and Doctor Who - woven throughout the story. The plot that throws Charlie and Daniel together feels a little contrived, though, and the romance just never feels real to me. Daniel's emotions and motivations come across as more authentic than Charlie's, where she comes across as more stilted. The book just never really sells the romance, making me feel slightly disappointed. The ending of the book also seemed a little rushed and was, at least for the most part, predictable. Overall, it's a fun little romance but lacks a deeper connection. I received an advance copy of this book from the publisher via NetGalley in exchange for an honest, unbiased review.